Whereas the Renaissance and Baroque were both originally associated with Italy, Rococo was more of a French thing from the start. Rococo was soon replaced by Neoclassicism. Although this happened during the reign of Louis XVI, it could be associated with the significant changes that happened in France towards the end of the 18th century. Rococo was condemned by the people who linked it to the monarchy. Neoclassicism came as a return to order. Several streams were notable during this period, one of them being the Greek Revival which lasted until the end of the 19th century. It was this style that award-winning designer Shah Gilani, ASFD, based his design on for the French Headboard. 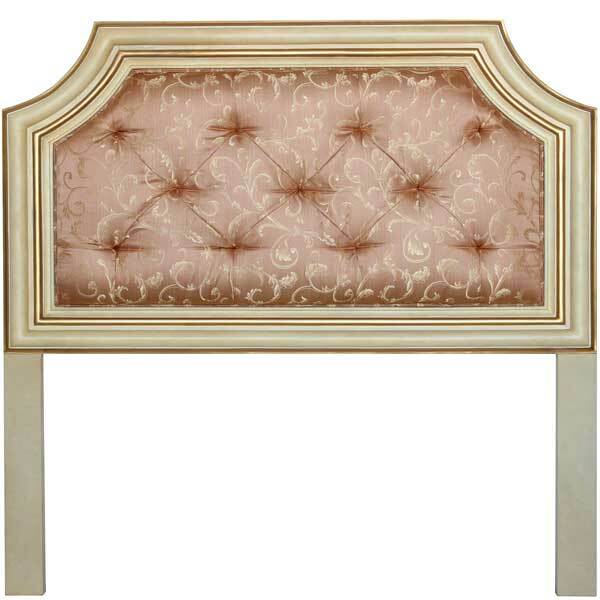 Available in king and queen sizes, the headboard is offered in a variety of finishes and accents. It can also be made, by special order, as a complete bed which is accomplished by adding a footboard and side rails. Upholstery, as shown, is in COM. With its timeless European style elegance, it makes an exceptional bedhead for upscale residential and hospitality bedrooms. Custom sizing is available. In addition to our standard product, we are often called upon to design and manufacture according to the client’s unique requirements. We welcome international orders. Our shipping department can arrange customs clearance and delivery to your door anywhere in the world.